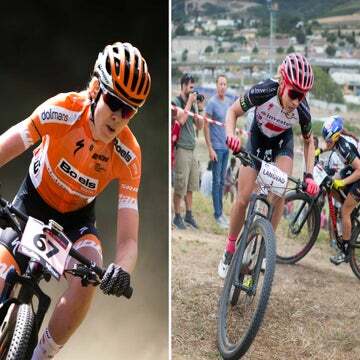 MONTEREY, California (VN) — Riding solo for the final three laps of racing on a cool, windy morning at Laguna Seca, Annika Langvad (Specialized) won the women’s XCO race Thursday at the Sea Otter Classic. The Danish champion won the 35km race by 31 seconds, ahead of Erin Huck (CZ Racing). World champion Kate Courtney (Scott-SRAM) was third. From the start, Courtney took charge, leading a group of four riders through the first of seven laps. She was followed by Langvad, Chloe Woodruff (Pivot-Stan’s), and Sophia Gomez-Villafane (Pivot-Stan’s). After the furious first lap, things regrouped at the front with Huck bridging to the leaders along with former world champion Catharine Pendrel (Clif). 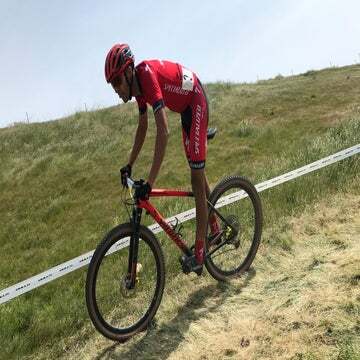 However, the five-kilometer course’s steep climbs began to take their toll on the group with the Pivot-Stan’s duo of Gomez-Villafane and Woodruff falling off the pace. By the fourth lap of racing, Courtney had also been dropped by Huck and Langvad. Woodruff would end up fading back to sixth place but didn’t regret the hard early effort to make the front group in the first half of the race. The Danish champion Langvad continued to ramp up the pace and a lap later, she had a five-second lead on Huck, which she quickly extended to over 20 seconds by the last lap. Huck said that Langvad was making up ground on her in the course’s power sections. “I think on the second half of the course, with the bumpy descent and the flat, pedally section, she was able to put some time on me with her full suspension; I was getting a little rocked on my hardtail,” Huck said. Langvad held her comfortable advantage to the end, with Huck and Courtney in second and third, respectively. Having just won the Absa Cape Epic stage race a few weeks ago, Langvad admitted she had doubts that she was recovered in time for Sea Otter.